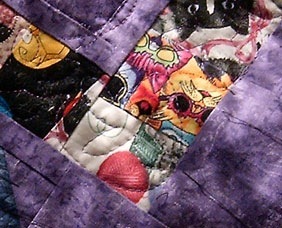 Wow .. the quilting on these kitties is DONE .. but I can’t do the kittyhappydance yet. Just a few more things to do .. There’s my 2 fan kitties that are still minus their heads and tails that need to be appliquilted on .. I know where the heads are, but I think that I’m going to cut out new ones as I’ve gotten a new idea that I’m going to try .. that along with a few other little things I want to do is going to be done tonite, then it’ll be time to cut the binding 😉 WOOOO HOOOOO – A year later and it’s almost done .. how cool is THAT! 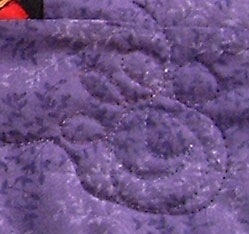 Originally I wasn’t going to do any quilting in the narrow border, but on looking at my motifs and the spacing from the edge in some cases, I thought it would be better safe than sorry .. so I wanted something that wasn’t to fussy for there and fairly easy to free hand .. that border is 1¾” – not to much you really want to do in that small of a space .. So, I decided upon some really simplistic butterflies in a continuous line .. no marking for these or tissue paper .. total freehand – and you can tell, but that’s okay .. they all look the same (for the most part) I’m good with it and pretty pleased too! I turned the butterfly on an angle to put in the corners of the borders for easy joining from each side. Then the outer border – that one I used tissue for and I printed them out instead of drawing them .. it went OOOOOH so much faster! And considering my scotch tape is still MIA (course NO ONE has seen it GRRR), I opted to use a dab from a glue stick for sticking it to the regular paper for running thru the printer. For this border I used a cat paw and the cutest mouse alternating in the border. They are almost the size width so it was easy math wise to work them in .. I didn’t use the original paws I had picked out as it ended up just being wayyy to busy .. maybe for the main quilt part .. but not the border – well maybe a wider border, but these are 3½” – and why not keep a good thing going, I used a paw in the corner to connect the sides. My original plan was to use white thread for quilting this and I am glad that I did find this variegated and decide to use it .. altho, it doesn’t quite make the statement that the white would have, it still does the job and I’m pleased with the overall results so far ..
Now I’m off to do my fru fur and appliquilting – then binding.. wooo hooo then I can do the kittyhappydance!! I’m so impressed with the paws border in particular! I like the butterflies, but I couldn’t make out the meeces. Great job, Grace. You do so much with your quilts. I’m going to have to try the tissue paper. I used newsprint with a quilt, and every time I look at it, I find a piece of paper still stuck to it. I’m encouraged to give new things a go because of you. How cute that is, Grace! Great job on the quilting!